Gari is a fine to coarse granular flour of varying texture made from cassava tubers (also called cassava roots) which are cleaned after harvesting, grated, water and starch squeezed out of it, left to ferment and then fried either in palm oil or without palm oil and serves as a major staple food in West Africa. 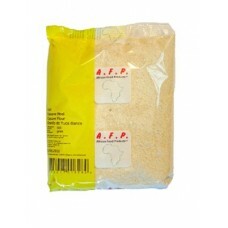 It is also called garri or gali in some parts of sub-Saharan Africa. It is also popular in South America, where it is called manioc Flour (Farinha de Mandioca).